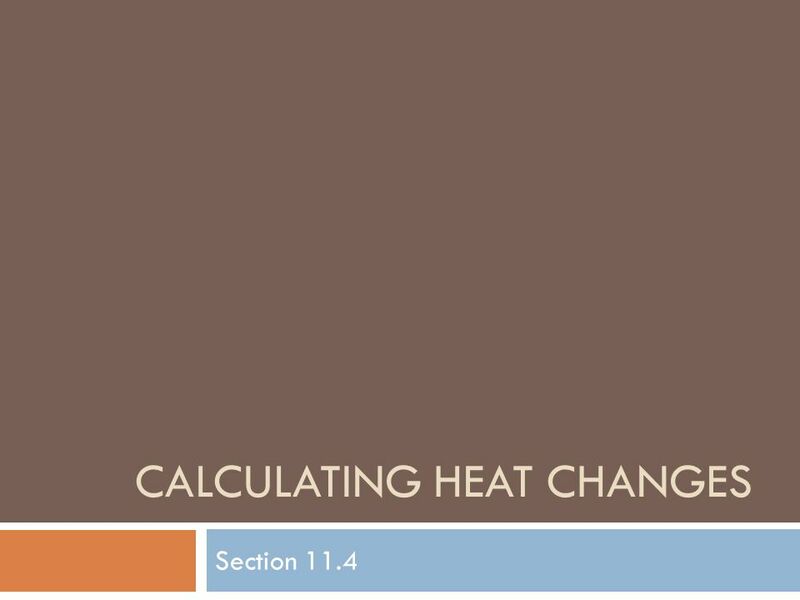 Download ppt "Calculating heat changes"
Energy Lecture 4 Hess’s Law & Review. Thermochemistry AP Chem Ch. 6. 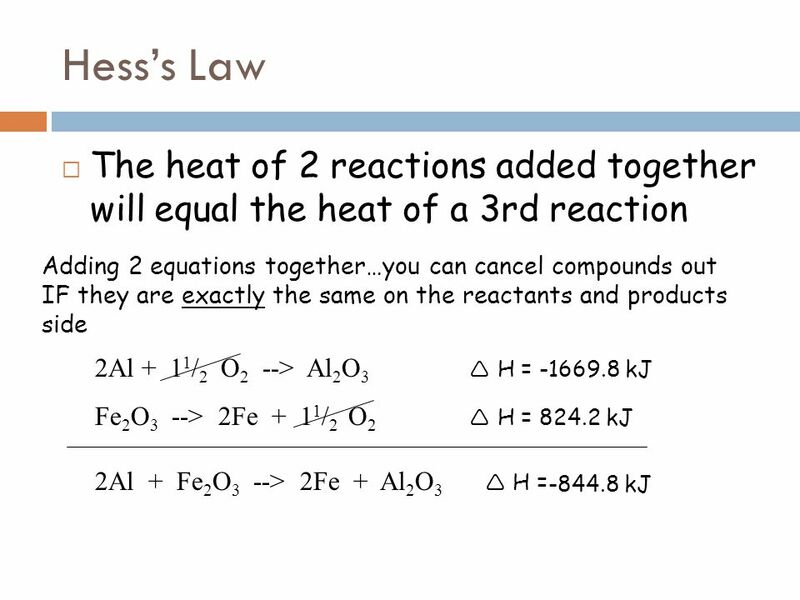 HIGHER GRADE CHEMISTRY CALCULATIONS Hess’s Law Hess’s Law states that the enthalpy change for a reaction depends only on the enthalpies of the reactants. Thermochemistry Exothermic reactions release heat to the surroundings. Fe 2 O Al  2 Fe + Al 2 O kJ Potassium Permanganate Reaction Demo. Bond Enthalpy L.O. :  Explain exothermic and endothermic reactions in terms of enthalpy changes associated with the breaking and making of chemical bonds. Thermochemistry 2 Hess’s Law Heat of Formation Heat of Combustion Bond Enthalpy. Thermochemistry “The Quick and Dirty”.  Energy changes accompany every chemical and physical change.  In chemistry heat energy is the form of energy. 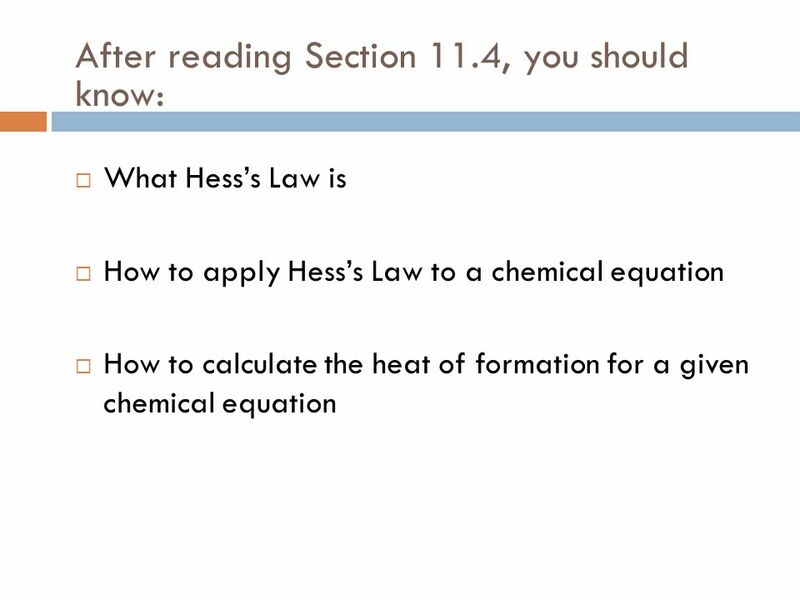 Hess’s Law EQ: Why is Hess’s Law a useful tool in solving for ∆Hrxn? Using Standard Molar Enthalpies of Formation SCH4U0. 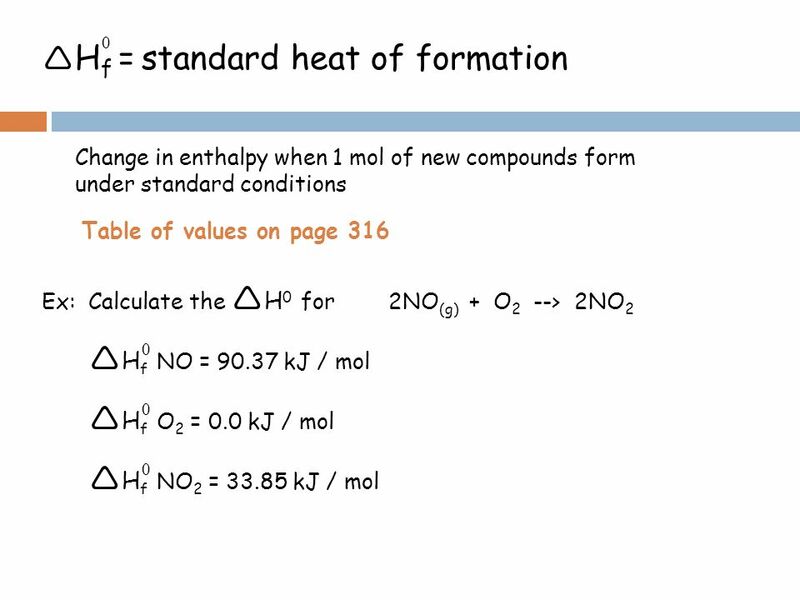  Enthalpy changes also occur when a compound is formed from elements.  Standard enthalpy of formation, ΔHº f, is the heat released or absorbed when one. 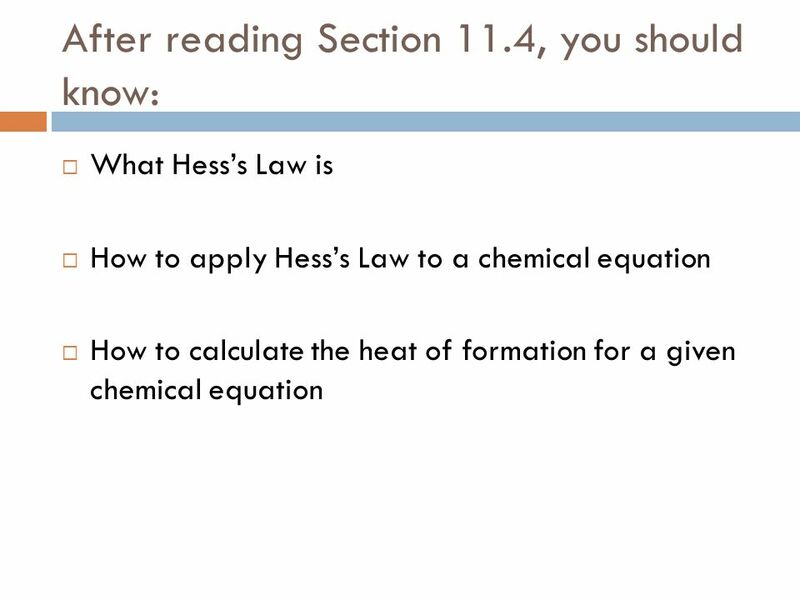 Sections 5.4 – 5.6 Energy and Chemical Reactions. 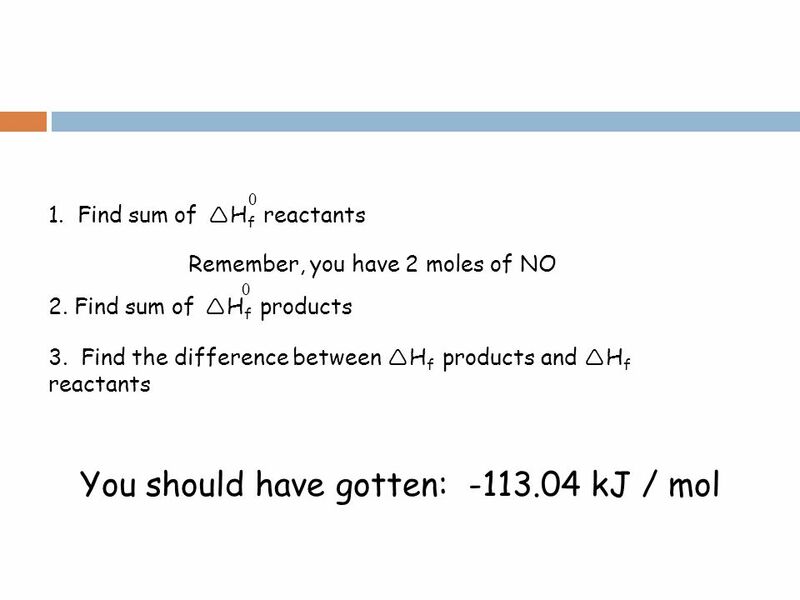 Standard Enthalpy Changes =  H o P = 1 bar (0.997 atm) T = 298K, unless otherwise specified n = 1 mole for key compound. 1 For an ionic compound the lattice enthalpy is the heat energy released when one mole of solid in its standard state is formed from its ions in the gaseous. The heat evolved or absorbed in a chemical process is the same whether the process takes place in one or several steps. Enthalpy and Hess’s Law. From the homework, you may have realized that  H can have a negative number. It relates to the fact that energy as heat has. Good Morning! 9/20/2015  Today we will be… Preparing for tomorrow’s test by going through the answers to the Practice Test  Before we get into the practice. Thermochemical equations Thermochemical equations  Thermochemical equation = a balanced chemical equation that includes the physical states. THERMOCHEMISTRY CP Unit 9 Chapter 17.